(Montreal, Que.) 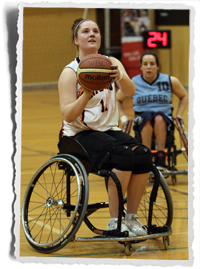 The Calgary Rollers and the Edmonton Inferno will battle for the gold medal at the 2013 Canadian Wheelchair Basketball League (CWBL) Women’s Championship at the Collège Édouard-Montpetit in Longueuil, Que. Quebec and the BC Breakers will collide in the bronze medal contest at 9:45 a.m. on Sunday, with the championship game set to follow at 11:45 a.m.
Edmonton defeated host Quebec 72-64 in the semi-finals to earn a berth to the gold medal match. Arinn Young was the top scorer for the Inferno with 28 points while national team member Cindy Ouellet countered with 40 points for the Quebec side. Calgary rolled over the defending-champion BC Breakers 57-40 in the other semi-final game. Jessica Forgeron drove the offensive attack for the Rollers with 15 points. Wendy Jansen led all Breakers players with 20 points. In a battle of winless clubs, Saskatchewan (0-2) and Ontario (0-2) will meet at 8 a.m. to decide fifth place. The Inferno secured the top spot in pool A with a 55-32 decision over the BC Breakers earlier in the day. The Rollers finished as the top seed in pool B with a 62-56 victory over Quebec. Quebec finished 1-2 on the day after defeating Ontario 57-23 in the morning and then falling shy of a rallying comeback in its loss to Calgary. The BC Breakers also defeated Saskatchewan 64-47 earlier in pool play.